Sports car driving doesn't come much better than this, especially at this price tag. A used Toyota GT86 may not have the bells and whistles of a modern equivalent, but it sure does drive well. Awarded the car of the year back in 2012, it's the result of a collaboration between Toyota and Subaru, with a classic sports car layout that harkens back to the glory days. It also has a curvy body shape and low driving seats, providing extra immersion as you are driving. The Toyota GT86 is the more conservative of the Subaru paring, as it features fewer styling options and decals. It's still an incredibly stylish car though, and the 2+2 cabin adds a sporty element that you don't find in many cars these days. You'll also receive fancy leather trims and red stitching on the steering wheel, alongside climate control and an automatic gearbox. There is a paddle shift system on the steering wheel should you want to make changes yourself. Aside from these, there's a host of driving aids, such as cruise control, and various safety equipment, including airbags for the driver's knees. You'll reach 0-62mph in 7.6 seconds in this car, with a top speed of 140mph. The car is incredibly light, while the low kerb weight contributes to how it handles. A limited slip differential is included as standard, adding to the car's credentials as a true driver's car. (The steering is quick too, with 2.5 turns from lock to lock.) This car was designed to be enjoyable to drive, providing more fun than almost anything in this price range. 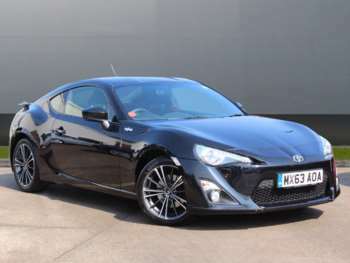 Got a specific Toyota GT86 model in mind?